See that place in the distance? Locate it with Superpin! 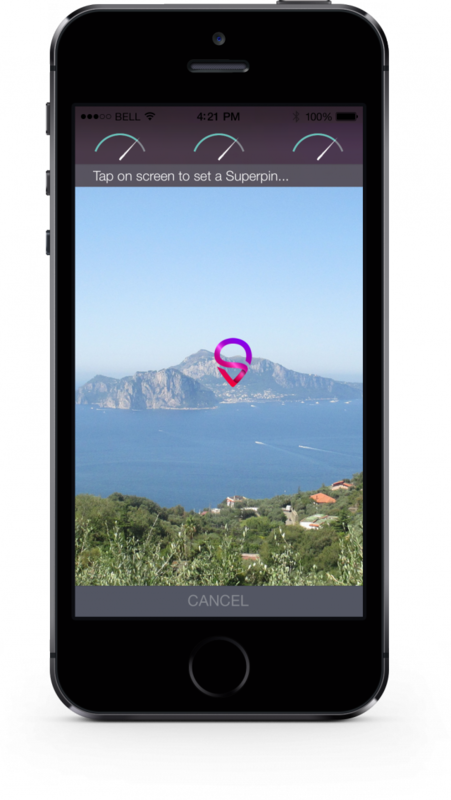 The first app that lets you drop pins on distant locations through your iPhone's camera. Imagine you're hiking in the mountains and enjoying the beautiful scenery. You see a distant point of interest (a campsite, hotel, or mountain peak), wonder how far away it is, and want to know how to get there. With Superpin the answer to all these questions is just a tap away. View the scenery around you through the iPhone's camera and drop a pin on a distant location with a simple tap on the screen; be it a small village in the valley, a mountain on the horizon or an island you see from the beach. Superpin even lets you drop pins to the depths of the sea. Just like that! -Instantly obtain a map which shows the pin's location. -Get it's distance, address and an elevation profile from you to the pin and beyond. -See the pin's environment via Street View as if you were there in person. -Get directions from your current location to the pin via Maps. -Keep all your pins organised in a colourful, interactive list for ease of access later on.